Sonam Kapoor is an acclaimed actress in of Indian cinema, who predominantly appears in Bollywood films. She has several hits movies to her credits including Raanjhanaa, Sanju, Veere Di Wedding, and Neerja. Known for her outspoken personality in Bollywood circle, she is one of the highest paid actresses and Bollywood’s most fashionable celebrities. She is also a celebrity endorser for brands and products. Besides a brilliant student in school, she has also excelled in sports activates too. Kapoor is often seen playing rugby, basketball in school and she is a trained Kathak, classical music and Latin dancer. Sonam Kapoor was born on the 9th of June 1985, in Chembur, Mumbai, Maharashtra, India. She is currently 33 years old. Sonam Kapoor is the oldest daughter of actor and producer Anil Kapoor and Sunita Kapoor, who is a former model and designer. She has two younger siblings – Rhea and Harshvardhan Kapoor, both are film producers. Her paternal cousins are actors Arjun Kapoor and Mohit Marwah, and maternal second cousin is actor Ranveer Singh. Sonam Kapoor studied and graduated from Arya Vidya Mandir school in Juhu. She then enrolled at the United World College of South East Asia in Singapore where she studied Theatre and Arts. Kapoor obtained a degree in Economics and Political Science from the University of Mumbai through distance programme. She also attended the University of East London and graduated with a degree in Economics. Sonam Kapoor married her longtime boyfriend and businessman Anand Ahuja on May 9, 2018, in a private ceremony in Mumbai. Her past relationships include Sahir Berry, a businessman and model, and film director Punit Malhotra. Sonam Kapoor made her onscreen debut with the 2007 Hindi film Saawariya for which he received a Filmfare Award nomination for the best female debut. She had her first commercial success with the 2010 Hindi film I Hate Luv Storys. She has featured on Koffee With Karan with actress Deepika Padukone. National Film Awards (Special Mention) – 2017. She is a great supporter of LGBT rights in India. Brand ambassador for the Elle Breast Cancer Campaign. Next Generation: Asia Class by The Hollywood Reporter in 2009 (First Indian actress to appear on the list). 100 most influential women on Twitter by The Huffington Post in 2015. Bollywood’s Best Dressed Actresses by Rediff.com in 2012 and 2013. Most Desirable Woman by Times of Indian in 2010, 2011 and 2012. World’s Sexiest Asian Women by UK magazine Eastern Eye from 2011 to 2014. Indian ambassador for international cosmetics manufacturer L’Oréal. Her net worth is estimated to be $11.5 million dollars. She takes Rs 2 to 3 crore per film. She is one of the highest paid actresses in Bollywood and is listed in the high-profile A list actresses. Since her childhood, she lives a luxurious life. Kapoor owns a BMW 7 Series Luxury Saloon, and an Audi Q7. Sonam lives in a luxury house along with her parents at 7th Road of the Ville Parle Scheme, in Juhu, Mumbai which is estimated to be worth Rs 25 crore. She worked as a waitress in a Mexican Restaurant while she pursued theatre and arts in Singapore. But, she was fired after 4 days. Sonam Kapoor worked as assistant director for movie Black (2005) directed by Sanjay Leela Bhansali before becoming a popular actress. She used to be stout and weighed around 90 kgs and had to shed down 35 kg for her debut film. Sonam wanted to become a director and writer, but Bhansali convinced her to do films and launched her in his first film, Saawariya. In fact, he waited around 1.5 years to cast her in films. She can speak fluently in five languages – Hindi, English, Punjabi, Urdu, Sindhi, and Marathi. She has been described by the media as a style icon for having a great sense of styling cues. Kapoor has vowed that she would never an actor. 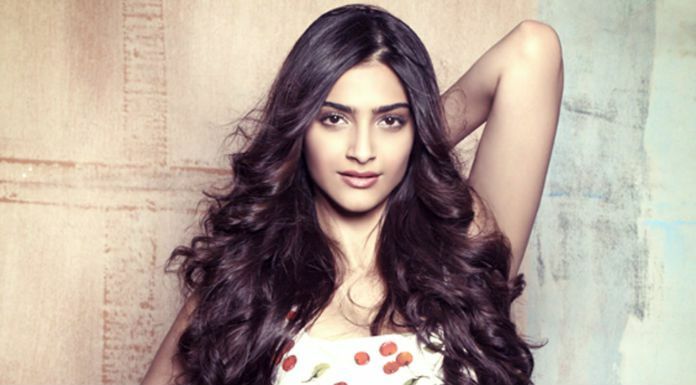 Sonam Kapoor suffered acrophobia while she was a teen, she got over it by going skydiving in New Zealand. Her first boyfriend was a dutch. She once had tongue piercing but had to remove it for her debut film. Apart from that, she had two tattoos.